Half Magic, Edward Eager, Scholastic, c1954, ISBN 0-590-40448-2, 217pp. There are some memories from childhood that I can never quite place specifically. Things that linger in memory, but are so faint that they are like a sniff of fresh apple pie from down the street that you can’t determine which house it is coming from. I recall reading some “magic” children books–at one time, I thought they were Andre Norton, who had several young adult novels with the word magic in the title, but I was never able to find the exact one. Until I ran across this book in the store, and realized a chapter into it that I was eating apple pie. 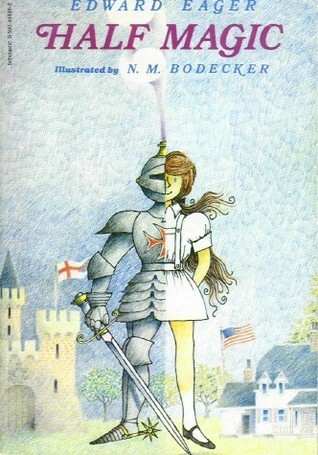 I love this book, but it may be because I remember it so fondly. 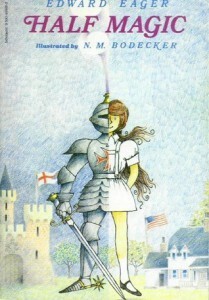 I’ve been trying to catch up on children’s fantasy the last couple of years–reading E. Nesbit, Norton Juster, P.L. Travers, E.L. Konigsburg–and, of them all, Eager is my favorite. In Half Magic, fantasy is rolled with some of the logic of science fiction, in that the wishes that the magic coin gives the children only occurs in halves, and they must figure out how to use it. As children, they are quite believable–maybe not as realistic as Nesbit, but not the Bobsey Twins either. I should note that Eager was himself a fan of Nesbit’s, and his stories do resemble her’s in some ways. His affinity for her is clearly laid out here, where the children visit the library and one of their favorite books is The Enchanted Castle.